China is home to the world’s largest disabled population. 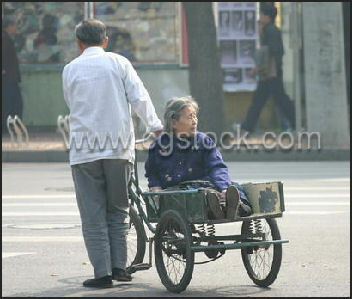 The are 83 million disabled people in China, with a million in Beijing alone. In the 1990s, 60 percent are illiterate, 40 percent are unemployed and nearly half can not find spouses. There are only 250 schools for handicapped children with a total enrollment of only 100,000 students. There are 4.2 million children disabled by congenital diseases alone. Handicapped people are routinely denied jobs, driver licenses and places in universities because of their disabilities although there are laws on the books that are supposed prevent such practices. Discrimination laws are undermined by laws that allow companies and government institutions to reject people deemed physically unsuitable. Students with a difference in leg length more than 5 centimeters or a spinal curve of more than four centimeters are not allowed to major in subjects such as geology, civil engineering, veterinary science, main science and forensic medicine. In some case they are note even allowed to take short courses in cooking, sculpture or archeology. Many Chinese believe that handicapped people have received their disabilities as a punishment or are victims of bad luck or evil spirits. Many have been abandoned by their parents. Restaurant often refuse to admit people with deformities out of fear they will scare off customers. On social worker in Beijing told the Washington Post, “Chinese government and society tends to treat the disabled with condescension, treating them like a charity case instead of giving them equal respect.” Many people blame the breakdown of Confucian values as a result of Communist political campaigns for the lack of empathy and compassion towards those with problems. The laws covering the rights of handicapped were revised and improved in mid 2000s after several government agencies banded together with the support of members of the public to change the laws. The Chinese government spent $1.7 million to have braille signs and wash basins, toilets and handrails that can be use by people in wheelchairs in the new airport terminal that opened up in 2008. 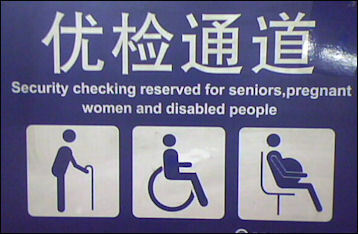 But the most parts China are still woefully lacking in facilities for the disabled, Most buses and taxi cabs are are not wheelchair friendly. When there are wheelchair ramps they are often too steep or blocked by bicycles. 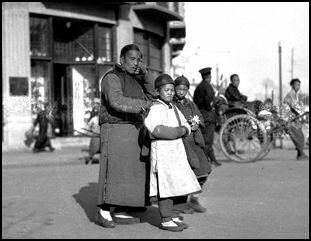 Blind man in the 1920s There are around 12 million blind or visually impaired people in China. Only about 5 percent of the blind in China receive any kind of formal schooling. There are only 105 schools for China's 5 million sight-impaired people. In these schools children sleep nine to a room. Often, the only job opportunities open to many blind are positions as acupuncturists or masseuses. Blind people enjoy some benefits. They are exempt from school fees and receive financial aid for starting up businesses. In Beijing, an effort has been made to eliminate uneven sidewalks and floor in public buildings. Still, China is far behind other industrialized countries in the care it offers t the visually impaired. As of early 2008, there were only five guide dogs for the blind in all of China, four in Dalian and one in Beijing. A partially-sighted, former Paralympics athlete with the guide dog in Beijing was unable to go out with it because of a Beijing city ordinance that prevents residents from keeping large dogs. Deaf people have more opportunities. The Chinese Disabled Person’s Art Performing Troupe performs the Qianshou Kaunyin (Bodhisattva with a 1,000 hands) is made of young, attractive deaf women. See Dance. A new law that went into effect in June 1995 banned marriages between people "with certain genetic diseases of a serious nature" unless they agreed to sterilization or long-tern contraception first. The measure also requires doctors to "advise" couples to get an abortion if they detect a hereditary disease, infectious disease or abnormal fetus. In a speech supporting the new legislation the Chinese Minister of Public Health said, " China now has more than 10 million disabled people who could been prevented through better controls." Eugenic laws banning childbirth by the mentally retarded people were passed in 1988 in the Gansu province, where rates of cretinism are high. Many government officials also advocate sterilization for the mentally ill. In the early part of the 20th century, at least 16 states in the U.S. passed eugenic laws that authorized the sterilization of the mentally retarded, epileptics and people judged as insane. In the United States and many other countries today prospective parents can screen their unborn children for congenital defects and chose to abort the fetus if there is a problem, but unlike China, where the state decides, the choice is up to the individual. Handicapped Chinglish Ultrasound is used to screen deformed and retarded children. One man with a physically disabled 10-year-old son told Newsweek he would have had his son aborted if had known about his condition before he was born. "My son is not a good contribution to the country or society," he said. A new law that has been discussed wants "to control the reproduction of people with venereal disease, hepatitis and other diseases." One Chinese doctor told the New York Times that he was shown a training video advocating the sterilization of deaf people before marriage to prevent the possibility of transmitting deafness to their offspring. "The video showed a woman who was deaf holding up papers showing that she had been sterilized and then she was granted her permission to get married," he said. There is no scientific evidence that deafness, syphilis or hepatitis can be passed from one generation to the next. Cretinism?mental retardation caused by insufficient consumption of iodine, especially among children born to women with iodine deficiencies?is a problem in the countryside, particularly in China’s poorest provinces. Many villages have a shazi (“idiot”), who is often has no name and is simply called shazi. Many are in their forties or older and are the products of a time when there wasn’t much iodine in the peasant diet. "Cretinism is reportedly so severe” in rural areas of Gansu Province, Tom Post wrote in Newsweek, "that broad areas are composed of 'idiot villages' in which half the inhabitants suffer from retardation.” With the widespread distribution of iodized salt the number of births of mentally handicapped children has been dramatically reduced. The government is supposed to provide families with mentally retarded children about $10 a month to help take care of them. Government officials are reluctant to fork that much over and villagers have to fight to get it. Autism was only recognized a problem by the Chinese medical community in 2006. Few Chinese have heard of it. The status quo is particularly alarming when one considers that early diagnosis and therapy beginning at an early age are thr only known ways to help autistic people lead a relatively normal life. He Zhimin, meanwhile, is no closer to finding his son. He fears that whoever is holding him may have spirited him far away to avoid detection. It's not an unreasonable fear; when the disabled workers were rescued in December in Xinjiang, one was found to have been transported 2,000 miles across China. He Zhimin continues to go out every afternoon, driving through the countryside near the brick factories, thrusting fliers into the hands of passersby. By now, most people recognize him, so they simply shake their heads: No, they haven't seen his son.